Fall is officially upon us and has been for a few weeks. This past weekend I finally managed to pull out the last of my summer veggies and plant my bulbs for the spring. I have a nice row of tulips at the front of my garden and some garlic planted in the back corner Where I hope it won’t create too much shade for the rest of my plants. I love home grown garlic but it is a big user of real estate, so I have only planted about six bulbs. 36 square feet isn’t exactly enough garden to grow copious amounts of anything! However, it is still 6’ X 6’ of garden space that is all mine, and I intend to make the most of it! I still have some beautiful nasturtiums in my garden that I will probably leave until the frost kills them. I have already harvested some seeds although honestly I probably didn’t need to. I am sure I will have plenty of plant volunteers next spring. However, with the seeds I can be a little more selective about where things grow. Based on this I could leave my hummingbird feeder out all winter but, as it is glass, I hesitate to leave it out during the freezing months. I will be leaving my bird seed feeder out for the winter, however. Pretty sure my jays and chickadees will appreciate that. Most of the plants in the back will either go dormant or die off when the frost comes. I have a few plants that I am not sure what to do with, however. My ivy and my sage are both perennials, but both are still relatively young and have shallow roots so a deep freeze over the winter months may kills them. I need to decide if I want to leave them in and see how they fare, or bring them in for the winter. And if I bring them in, where do I put them? My house is so dark that they might just die anyway. One option is to move them both to the deck outside my bedroom. It is warmer and more protected there, and I can construct a little greenhouse area on my shelves to protect them. This is likely what I will do, assuming that I find the time before the cold arrives. We are having an unseasonably warm fall as predicted so it is likely I have a couple more weeks before I have to worry about this. My backyard garden. I am thinking of turning this into sort of a fairy-like garden....lots of ferns and shells and decorative little things. My chocolate mint. I cannot remember how old this plant is, but it simply thrives every year, no matter what the conditions. My cucumbers are going wild this year! I planted four plants, I think I will get dozens of these delicious veggies this year. My crazy 36 square foot garden plot! The same plot, looking slightly less chaotic. We are approaching the middle of summer and I have had one of the best gardening seasons of my life to date! The fact that the weather has been hot and dry is definitely a factor. It allows me to have complete control over the level of water my plants receive. Obviously that ongoing drought is a major concern for other reasons, but it has been pretty beneficial to my cucumbers. I will be doing a photo collection of the garden in the coming week while I am a bachelorette (for a few days, anyway!). It will showcase my flourishing veggie garden, my funky little rainforest back patio plant selection, and my potted patio garden. I am seriously thinking of getting or making a mini greenhouse for my patio garden. I already have a shelving unit, would it be that hard to grab some clear poly to create a neat little space to ripen my peppers and tomatoes? I think I see a project in my future!!! I am also pondering my plans for my next garden already. Although I have been really happy with the success of this garden, I am finding that I am not getting the variety of veggies that I was hoping for. I am going to do a bit more research into square foot gardening to see if I can squeeze more out of my 36 sq ft.
And of course, there is the pondering of a winter garden. 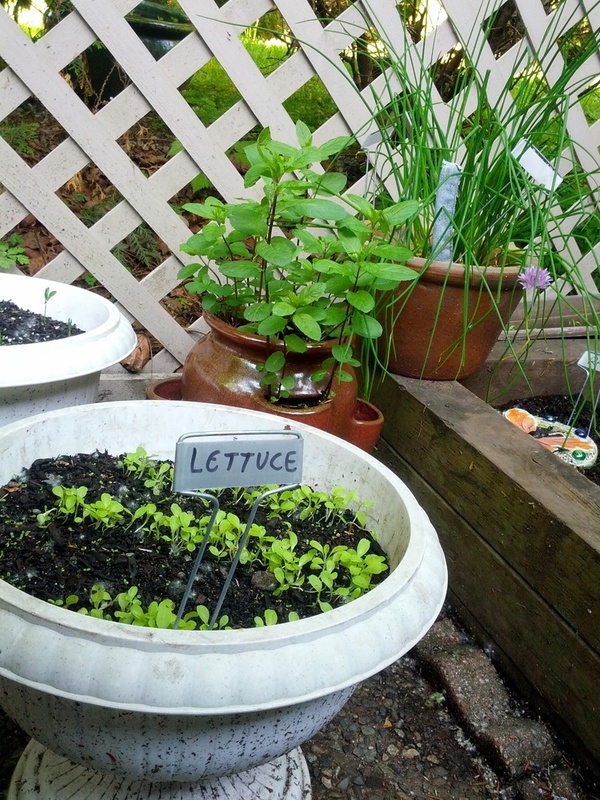 I wonder if my neighbors would mind if I used a cloche to grow lettuces? Should I overwinter garlic? What bulbs do I want to plant this fall? 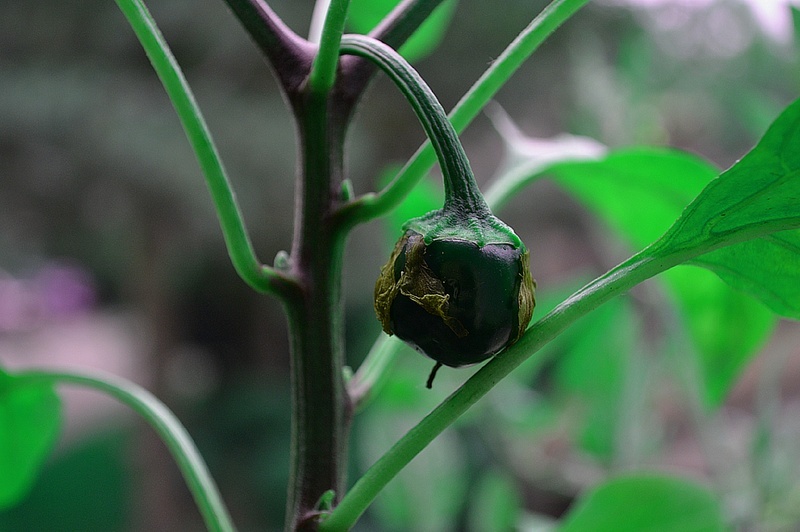 So many questions, so many plans…it really is a wonder that I have to do anything besides garden! Yay! 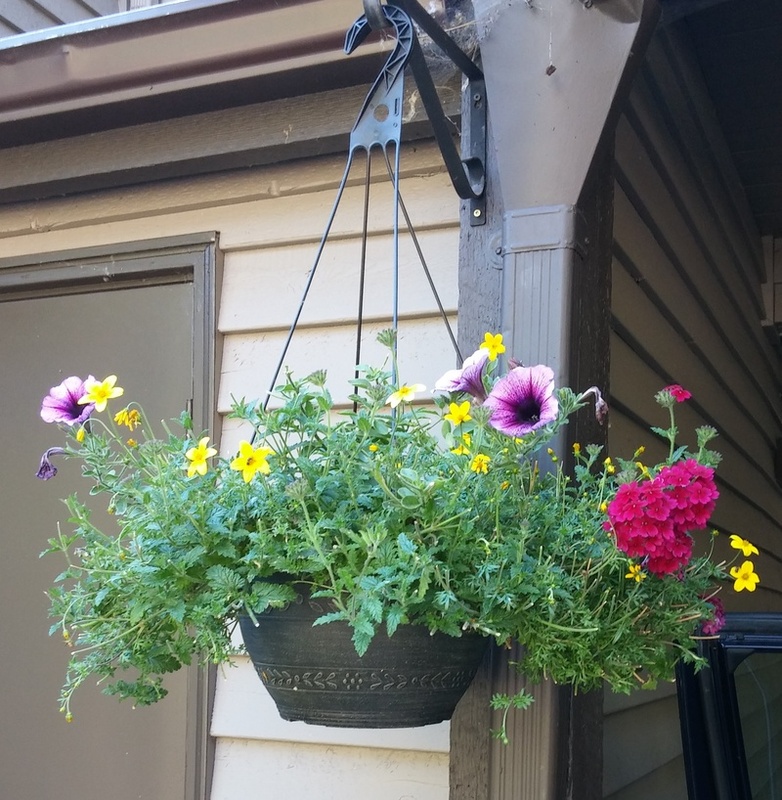 My hanging basket is coming back to life. I really thought that I had destroyed it, but after a week of leaving it alone (well, except for lots and lots of water in this crazy heat!) it looks healthier than ever. Hello strangers! Sorry for the long delay. Much has happened since my last entry. Thus far I have enjoyed strawberries and radishes from the garden. Cucumbers are imminent, and I hope to see some sweet pea buds any day. There is much more to write about, but it will have to wait for another day. I hope to have a lot moer info and pictures about my garden ready to share by the end of the month. I have begun creating a new garden in my home. I've been here for nearly a year now, but last year I moved in on July 7th, a little late to do much with my gardening space. This year, however, I (sort of) have the time to do something with it and so I have begun, slowly but surely, to create a little growing space here for me and my family. I've created a small garden space on my back deck but it doesn't get a lot of sun and I have been really struggling to get it to produce much. Fortunately I have a small garden plot in the front that gets a decent amount of morning sun, so next year when I have a chance to build a raised bed there I should be able to get some veggies to grow. This year I am focusing on the small part of my outdoor gardening that seems to be working - my deck. I have tomatoes, peppers, and strawberries growing quite happily. When we purchased our new home I knew that I wasn't going to be blessed with the sunlight of our condo. The two bedroom apartment was practically a greenhouse for my plants, whereas we are now living in a shaded cabin in the woods! However, at first my plants didn't seem to mind the transition. We have large windows and patio doors in our living room so, although they didn't get the direct light that they were used to, my plants were still getting enough sunshine throughout the summer months. Plants began dropping left and right. My money tree is in shambles. My ivy is pretty much dead. Even my hardy Yucca is not the speciman that it once was. My ficus has done admirably, as have my orchids (shocking, really) and my spiderplants. We all know that spiderplants will grow anywhere, so my plan B is just to grow A LOT of those if nothing else will take the darkness of my hobbit hole. Plan A is grow lights. I have two in my living room right now, and they seem to be making a positive difference. I try to remember to turn them on (and off!) every day when I go to work, in addition to opening the curtains to let what feeble natural light is available into the house. It's been about a month and thus far I haven't lost anymore of my green babies, but the overall success of my attempt remains to be seen as we head into the darkest time of the year. We have been nearly a month in our new home and I am finally feeling settled. However, no garden will be planted this year. It is just too late in the season and this summer is just too filled with plans. Next summer, however, will be filled with PLANTS. Thus, this summer I will need to find time for planning. I have two different locations (at this time) to grow. There is talk of starting a community garden in the complex and, if that comes to fruition, I will definitely be a large part of that initiative! However, for now I am just looking at the growing space attached to our townhouse. I have a small area in the front of our house that gets a significant amount of morning and early afternoon sun. However, this area is for "ornamental" gardens only, so while I might get away with an herb garden, I certainly won't be allowed to grow cukes and carrots. The balcony off of our bedroom faces the same direction, and this is where I intend to plant my tomatoes and peppers, possibly some strawberries. It is a small deck so I will have to be fairly creative with space but I think there is potential for a fairly high yield mini-garden. After all, I do have a fair bit of experience now with small space gardening. My actual garden plot is in the back, and unfortunately it does not get a lot of direct sunlight. Currently the plot is filled with semi-shade and shade plants (clematis, hostas, a few various bushes and a baby pine tree). I am going to try to salvage as many of the plants as I can but next year I want that entire plot cleaned out. 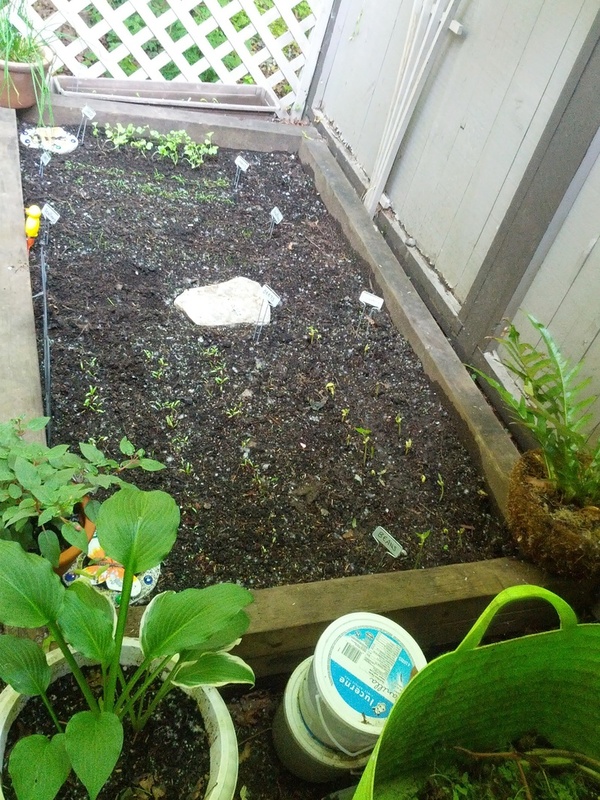 My goal is to grow lettuces and any other shade-tolerant veggies. I also want to expand the lattice work on the patio and grow cukes and sweet peas on the walls, where we get more sunlight. I still have a few plants in pots (my chestnut tree, hibiscus, mint, and oregano) and they seem to be doing fine, and over time I will probably be adding to the potted garden back there as well. Finally, outside our back patio is a space with some cedar bushes and gravel. I am not a huge fan of cedar and my husband is allergic, so I am going to look into removing these and replacing them with berry bushes (blueberry and raspberry, hopefully, although the raspberry will probably have to be potted to prevent spreading). All of my indoor plants seem to be adjusting well to the dramatic change in light. We have big windows and I have a couple grow lights set up inside and (yay!) we haven't lost any yet. *FINGERSCROSSED* it stays that way. Pictures of the new space to come!